My mother made marshmallows once when I was growing up and we noticed something different about it: the marshmallows melted in the hot chocolate (unlike the store bought ones). You will be pleased to hear that they are not difficult to make at home and your children will love you and crown you mother of the year (or father of the year if you are a father). Food Network has a good version from Alton Brown. In the bowl of your electric mixer combine the gelatin and 1/2 cup of cold water and allow to sit and soften the gelatin. In the meanwhile make the syrup: Combine the water, corn syrup, salt and 1/2 cup of water in a small pan and cook it until the sugar dissolves completely. Continue cooking until a candy thermometer reads 240F then remove from heat. Attach the whisk attachment to your mixer; and with the mixer running on low speed, slowly pour the syrup into the dissolved gelatin. Once the liquid is combined, increase the speed to high and whip it until the mixture is thickened (about 15 minutes). Add vanilla and mix to combine. Coat a 13x9x2″ baking dish with a non-stick spray like Pam. Spread the marshmallow mixture into the pan, sprinkle liberally with powdered sugar. Allow to set. After it has set, turn it out onto a powder sugar coated cutting board. Spray a pizza wheel with more Pam spray. Cut into marshmallows. 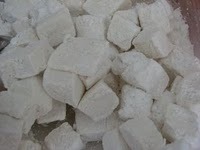 Put into a plastic container with more powdered sugar. Put the lid on, shake the container to coat the cut marshmallows with more powdered sugar, so they don’t stick to each other. Store for up to 3 weeks if they last that long. Thank you Alton Brown on the Food Network. Categories: Uncategorized | Tags: Fall Comfort Recipe, Homemade Marshmallows | Permalink. 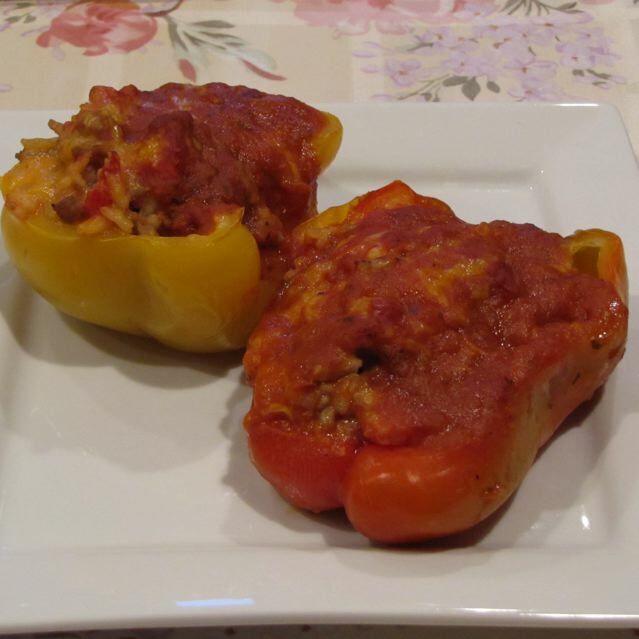 I made another stuffed pepper recipe that I got from allrecipes. I made a few changes to the recipe. I used Jenny-O Turkey Sausage instead of ground beef, added some seasonings like garlic and oregano and used Arborio Rice, and instead of using green peppers, I used yellow and red bell peppers. The mixture took a little longer to cook than the recipe stated, but with some patience and growling stomachs the end result was very delicious. I am sure you will also like this rendition if you try it. Bring a large pot of water to a boil and add about 2 tsp salt to the water. Boil the sliced and cleaned peppers for 5 minutes and then turn off the water and let them simmer in the water until they are ready to fill. This will help soften the peppers. In a large skillet, cook the onions in a little oil to soften them and then add the ground turkey (or beef) and garlic and cook until the meat is cooked through. Drain any fat or liquid. Season with salt and oregano. Add the diced tomatoes (with liquid), Worcestershire sauce, rice and water. Bring to a boil. Cover and let cook at medium heat for 10 minutes. Stir add more water if necessary. Lower the heat to low and cover and cook for another 15 minutes or until the rice is cooked mostly through. Add 1 cup shredded cheddar cheese off heat and stir into the mixture. Remove the peppers from the hot water, drain, and put them in a 13x9x2″ baking dish. Fill the pepper halves with the filling. Sprinkle the peppers with remaining cheese. Pour the tomato soup over the peppers. Bake at 350F for 25-30 minutes until hot and bubbly. Categories: Ethnic - American, Main Dish | Permalink. Here is another allrecipes hit! A dear friend of mine made it and posted the recipe on Facebook. Of course we made changes to the original. Here is the adapted version. We were on our way to church yesterday, when one of my kids decided it was time to get sick – so home I went with sick kid and then had to figure out what to make for dinner – I had ground beef, onions, roasted peppers, ricotta cheese, and spaghetti- so I could make this dish. I even had enough filling to make another one for a neighbor that just moved into the house next door. She was appreciative. Some changes that could me made are using Italian sausage instead of the ground beef, adding more spaghetti sauce to keep it moist. It had good flavor and we will make it again. Enjoy! Cook the pasta according to package directions. Drain and place in the bottom of a 10″ pie dish. While the pasta is still hot stir in the 2 Tbsp butter, 1/3 cup Parmesan cheese and 2 eggs and combine. I would also stir in 1 cup of spaghetti sauce into the pasta after you combine the egg, Parmesan and butter with the spaghetti. Cook the ground beef or Italian Sausage in a large skillet with the chopped peppers, onions and cook until the meat is browned. Drain the fat. Add minced garlic, salt, pepper, dried oregano, and crushed red pepper flakes; cook mixture for another two minutes. Add can of diced tomatoes and tomato paste as well as remaining 1/2 cup of spaghetti sauce. Heat the mixture through. Dollop the spaghetti in the pie pan with ricotta (or cottage cheese) and spread out over the pasta. Top with meat mixture. Sprinkle the top with Mozzarella and Parmesan cheeses. Bake in a preheated oven, at 350F for 20-30 minutes. Enjoy with a green salad and garlic rolls. 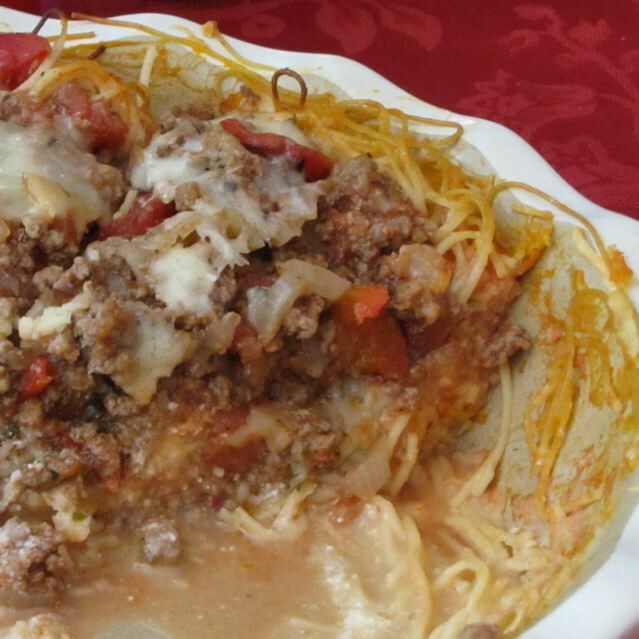 Categories: Ethnic - Italian, Main Dish - Beef, Main Dish - Pasta | Tags: Spaghetti Pie | Permalink. Yes, I know too many consonants and not enough vowels – but that is German for you! 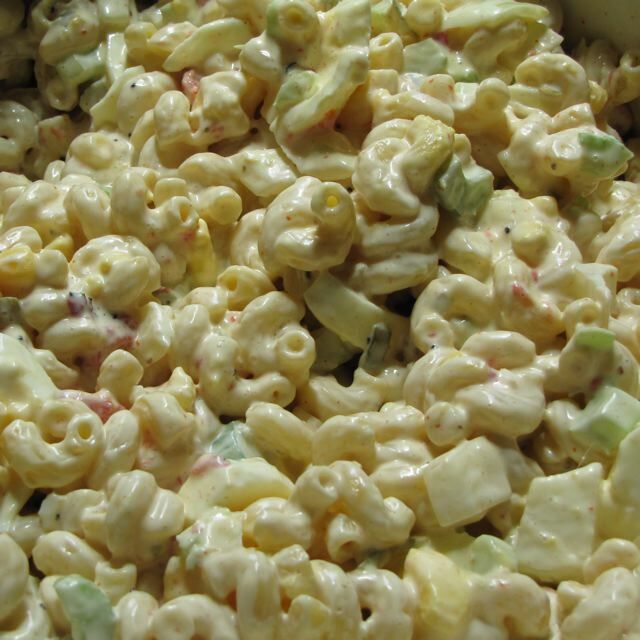 Here is a recipe my Mom would make frequently, when I was growing up. Recently I had beautiful organic plums that I wanted to use up and asked my Mom for the recipe. Now I can share it with you. It is not a very sweet dessert – I find American’s use way too much sugar in desserts anyway. This is best enjoyed with a nice cup of coffee. The batter is pretty thick, and plums are cut and placed on top of the batter and baked. A dusting of powdered sugar and this simple dessert looks attractive. You could make a variety of Kuchen (Cake in German). Cherry (Kirschkuchen); Apricot (Marillenkuchen). Cherry is my all time favorite, however because they are so small they leave the pit in the cherries which complicated eating the cake – I remember accidentally biting down on a cherry pit, which was not pleasant. You could probably even use pineapple as a topping too. Beat eggs and vanilla well, add sugar, beat, gradually add dry ingredients, add water, mix well. Pour into a greased 13x9x2″ baking dish. Press the plums (cut side down) on batter. Bake at 350 F for 20-35 minutes or until lightly browned. When cool, sprinkle with powdered sugar and cut into 12 squares. 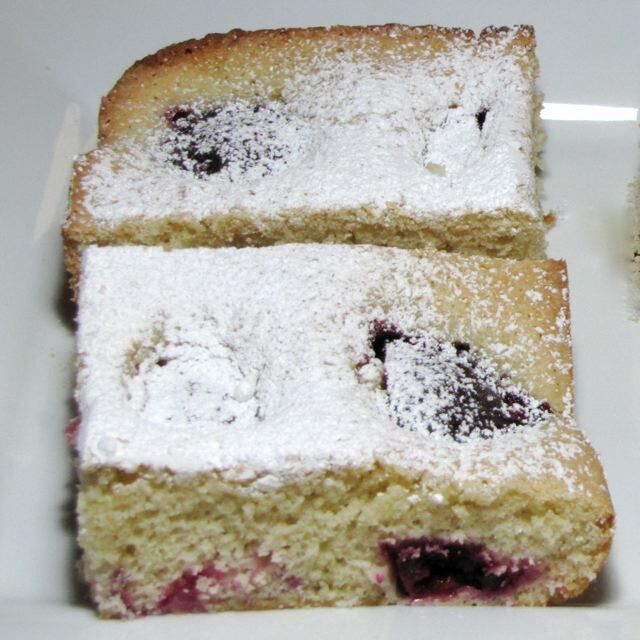 Categories: Dessert - Cakes, Dessert - Fruit, Ethnic - German | Tags: Austrian Dessert Recipe, Austrian Plum Cake, Zwetschkenkuchen | Permalink. For quite a few years I avoided making artichokes myself. I didn’t know what to do with them. They seemed prickly and uninviting! When one of my daughters was born I had a friend visit from Fresno to meet the new baby and she showed me how to make artichokes. They are too good not to eat! Fresh ones are so much better than the ones in the can and really don’t take much effort to make. Here is a quick guideline for those of you who also fear the “choke”. Fill a large pot with about 1 inch of water. 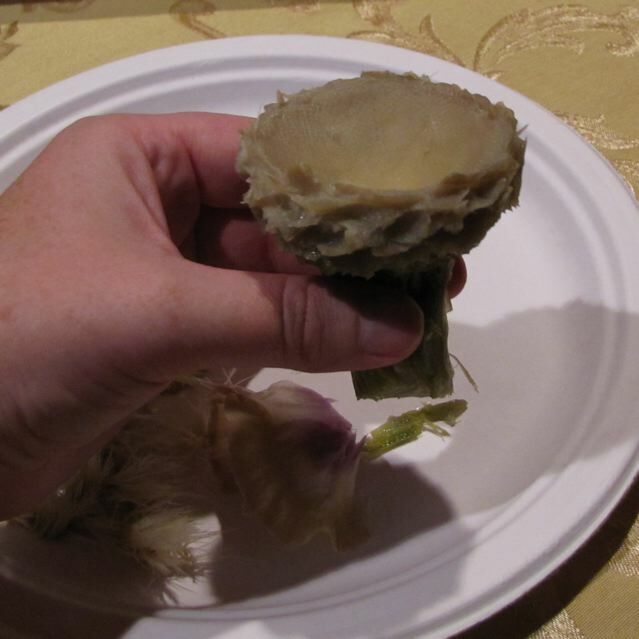 Cut the end of the stem of the artichoke and wash it. Remove some of the very outer leaves, if you don’t like the sharp ends of the leaf trim them with kitchen shears, or use caution when you handle them. Trim the leaves that are attached to the stem and clean the stem up a little scraping the outside layer with a knife. Season the water with fresh lemon juice and garlic seasoning or oregano and a drizzle of olive oil. Place the artichoke(s) in the water. Heat to a boil, place a tight fitting lid on the pot and reduce the heat. Cook the artichokes at a simmer for around 25 minutes. 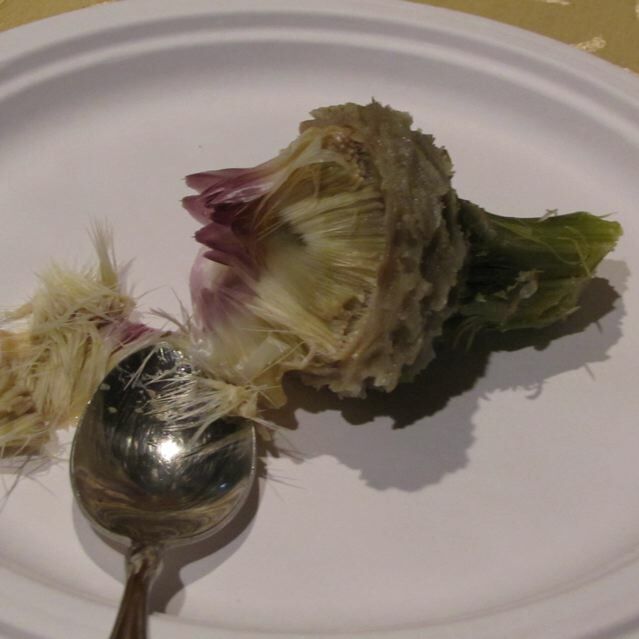 To check if they are done tug at a leaf near the base of the artichoke it it easily comes off the artichoke is cooked enough to eat. 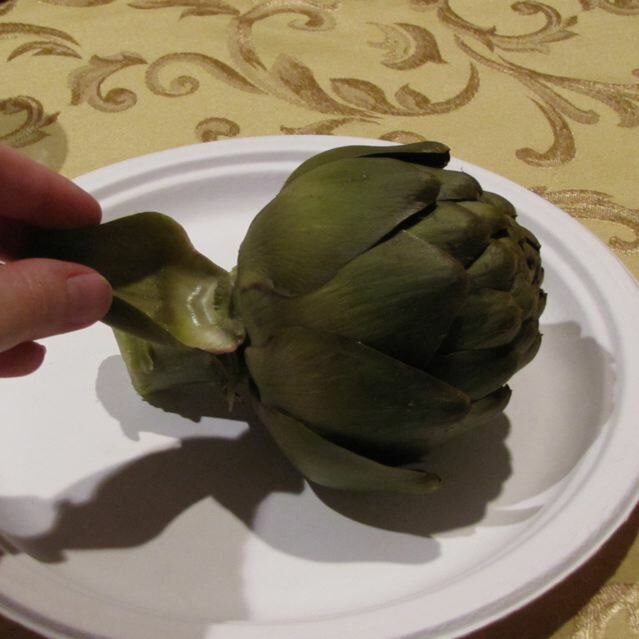 Remove the artichokes with some tongs and let them drip dry a little before you remove them to a plate. Many people eat the artichoke with butter or my favorite: mayonnaise. Do what you like. There are plenty of recipes out there for dipping sauces, or pasta recipes that use cooked artichokes. The ideas are limitless. 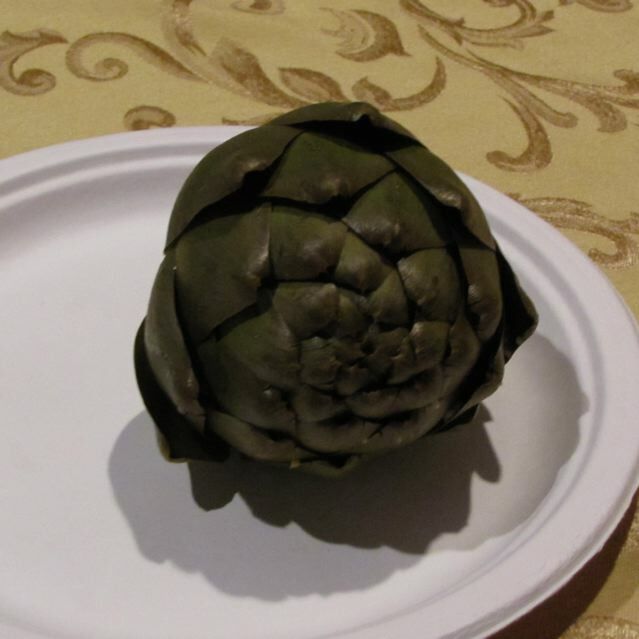 To eat the artichoke. Pull away the larger outer leaves, dip the base of the leaf into your dipping sauce and bite down on the leaf, pulling the leaf out of your mouth and scraping the artichoke flesh. Repeat until you have the purplish tender leaves near the choke. At this point get a spoon and gently remove the leaves and choke and dispose of them, they are not edible. The artichoke bottoms (and stem) are really good. Cut them into smaller portions and dip away. 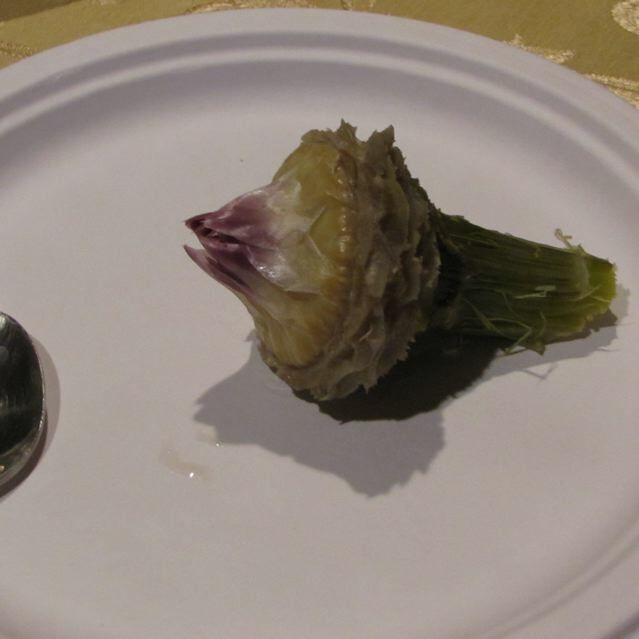 Categories: Side - Vegetable, Side Dishes | Tags: Artichokes | Permalink. 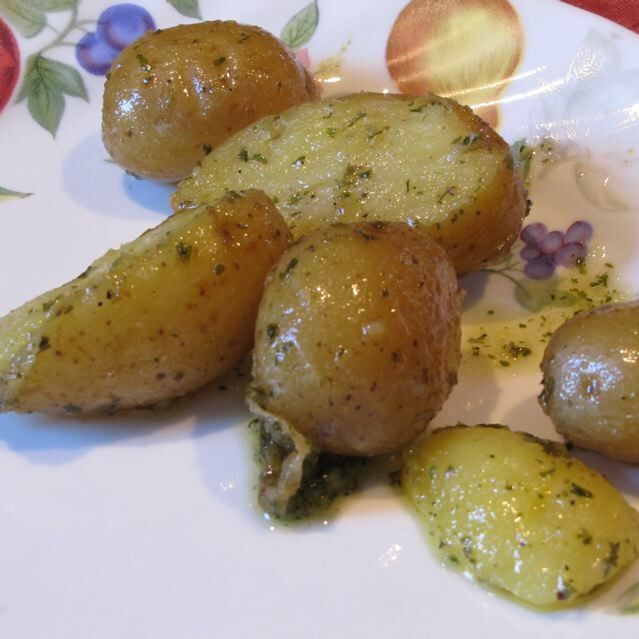 In Austria, Buttered Potatoes are commonly found on the menu of restaurants. It is comfort food to me. My family also enjoys eating these little nuggets of goodness. I like to use the Baby Potatoes (sometimes Baby Dutch Potatoes). Pre-cook them in boiling water for about 12-15 minutes, or until fork tender. Drain the water. Let the steam evaporate for them to completely dry. Add 3 Tbsp of butter and 3 Tbsp of olive oil to a hot skillet. Add the baby potatoes and toss them in the butter. Season with a few grinds of sea salt and sprinkle with parsley flakes (fresh or dried work fine). If you like garlic add garlic powder. Toss and stir the potatoes to coat from time to time and cook in the butter for a few minutes. Serve. They never last long at my house. My husband circles my son’s plate like a vulture if he does not eat them all and then when no one is looking pops them into his mouth. (I have eyes in the back of my head, so I know this). In a large skillet, heat the butter and olive oil until hot. Carefully add the cooked potatoes (make sure they are dry or they may splatter). Toss to coat them in butter. Add the salt, pepper and parsley flakes. Cook for 5-10 minutes. Serves 4-5. Categories: Ethnic - German, Side Dishes | Permalink.